Taking a page from Hugo Chávez’s playbook, Ecuadorian President Rafael Correa is intimidating and steadily increasing controls on his opponents. He regularly uses his Saturday morning broadcasts to name and shame them. 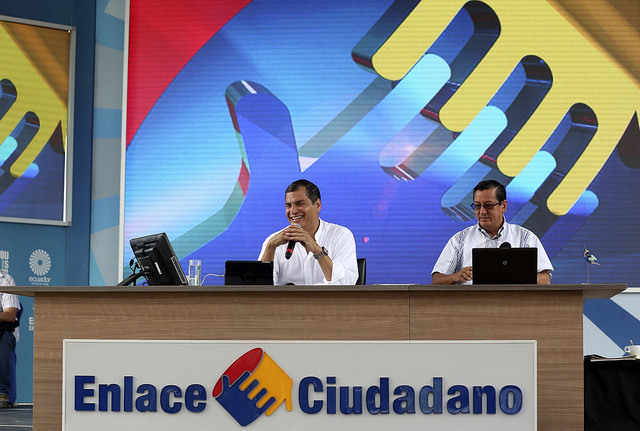 Actors from all walks of Ecuador’s civil society – journalists, lawyers, activists, academics, bloggers, union and social movement leaders – have been the target of his insults and thinly veiled threats on the weekly program, Enlace Ciudadano. In February, Correa’s show was skewered by HBO comedian John Oliver – and, to Oliver’s delight, Correa fired back by tweeting insults (click here and here). Journalists and civil society leaders applauded Oliver for drawing attention to the continuing deterioration of civil liberties in Ecuador. Correa’s virulent rhetoric and intimidating use of media is part of a larger matrix of policies endangering freedom of expression and association in Ecuador. Over the last two years, the Correa administration has worked methodically to mount a legal framework allowing for greater government control over the media and civil society organizations. The 2013 Law of Communication and a new oversight agency, the Superintendence of Information and Communication, are intended to ensure that all print and broadcast media provide “truthful information” that is “verified, contrasted, precise, and contextualized.” Superintendent Carlos Ochoa was selected from a short-list of nominees provided by Correa. Among alleged violations recently singled out for sanctions are items in the leading newspaper El Universo and its accomplished political cartoonist, Xavier ‘Bonil’ Bonilla. Issued in 2013, Executive Decree 16 also has civil society – from neighborhood associations to think tanks, business chambers, unions, and advocacy groups – under pressure. In addition to elaborate regulations for the legal registration of organizations, the decree stipulates conditions allowing the government to “dissolve” them. These include group involvement in “partisan activity” and “interfering in public policies.” To date, only one organization – the Fundación Pachamama involved in environmental activism – has been dissolved, but civic leaders fear that the decree will induce ”self-censorship” and stifle participation. The new laws amount to a project – unprecedented for Ecuador – of surveillance and regulation. They provide the government with a tempting arsenal of weapons to use, if necessary, in upcoming battles on other important legal matters, especially on the issue of presidential re-election. After years of pledging that he would not seek a third term in office, Correa reversed course and has tasked his legislative super-majority with finding a swift route to amending the constitution. Most public opinion polls show, however, that a majority of Ecuadorians would prefer a referendum to decide whether or not yet another consecutive re-election should be allowed. The road to re-election may be more difficult than Correa and his advisors imagine, but they enter the fray with the weight of the law on their side. With powers to control the media and limit the activity of civil society, the Correa administration enjoys the upper hand as 2017 approaches. *Catherine Conaghan is the Sir Edward Peacock Professor of Latin American Politics at Queen’s University in Kingston, Ontario. She specializes in Andean politics. She is the author of an article, “Surveil and Sanction: The Return of the State and Societal Regulation in Ecuador,” in the April issue of the European Review of Latin American and Caribbean Studies.